A “Police Accountability Task Force” was set up by Chicago Mayor Rahm Emmanuel in the wake of the release of the video depicting Laquan McDonald’s murder by Chicago Police Officer Jason Van Dyke. Now that task force has released its report and that report doesn’t play out well for the current oversight system of the Chicago Police Depatment. Last December Chicago Mayor Rahm Emanuel formed a task force to conduct a top-to-bottom review of the Chicago Police Department. That move followed calls for Emanuel’s resignation in the wake of the video release of the Laquan McDonald shooting. The public has lost faith in the oversight system. Every stage of investigations and discipline is plagued by serious structural and procedural flaws that make real accountability nearly impossible. The collective bargaining agreements provide an unfair advantage to officers, and the investigating agencies—IPRA and CPD’s Bureau of Internal Affairs—are under-resourced, lack true independence and are not held accountable for their work. Even where misconduct is found to have occurred, officers are frequently able to avoid meaningful consequences due to an opaque, drawn out and unscrutinized disciplinary process… Any one of these metrics in isolation is troubling, but taken together, the only conclusion that can be reached is that there is no serious embrace by CPD leadership of the need to make accountability a core value. These statistics give real credibility to the widespread perception that there is a deeply entrenched code of silence supported not just by individual officers, but by the very institution itself….Simply put, there is no ownership of the issue within CPD leadership or elsewhere, and thus there have been no substantive efforts to address these problems which continue to cost taxpayers tens of millions of dollars each year. The full report is close to 200 pages and we have not yet studied the whole thing. Most of the criticism is directed at the police department itself–and it is damning. 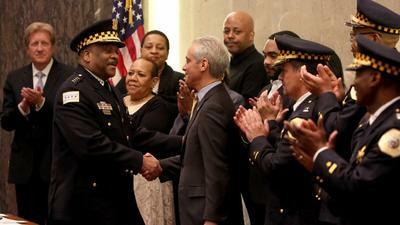 The executive summary says little about Mayor Emanuel or his culpability. Hmm. That last part shouldn’t be at all shocking. As stated, the task force was created as a result of demands for Emmanuel to step down as mayor and the task force consisted of people “hand picked” by him. Nor should the fact that the oversight system is wildly ineffective be any sort of surprising revelation. Much like the task force was designed to deflect blame from Mayor Emmanuel’s doorstep, the internal oversight system is designed to deflect blame from and cover up the actions of police who commit crimes, especially when they are of a violent nature that would inflame the public and cause unrest. In particular, so-called independent civilian review boards are rarely actually independent and generally made up of people with ties to and sympathies toward the police. In fact, sometimes the “civilian” members of these boards are actually retired cops or family members of police officers. Of course, the task force also cited a “history of racial disparity and discrimination” within the police, which even Mayor Emmanuel classified as a foregone conclusion, as a root of the problems with the department. A heaping helping of the blame was also rightfully placed on the police unions and their unwillingness to accept any sort of accountability or true oversight for police and the Bad Apples that are found so frequently within their ranks. In fact the member of the task force even stated in their report that the ability to implement the many reforms they recommended within that report were dependent on the willingness of the Chicago police union to accept them and the success of contract negotiations with the union. The Tribune also stated that the report puts Emmanuel in a “difficult spot.” That’s because people are pissed of about all the murders and other abuses by police, but Mayor Emmanuel doesn’t want to anger the violent armed gang that calls itself the Chicago Police Department anymore than he already has just by questioning their absolute authority and ability to do whatever they want without any sort of repercussions.